Child safety is extremely important, especially around the home. At MAX6MUM SECURITY we are making it our mission to help educate and teach children of all ages against the dangers they may face in the home, from answering the doors to strangers, to running, playing about with chemicals, window safety and even internet safety and talking to strangers. Each home safety topic will be featured in a different episode, which will include an animated video and song, and also a story book which will be available for purchase to read to your own children. Episode 1 – Window Safety! 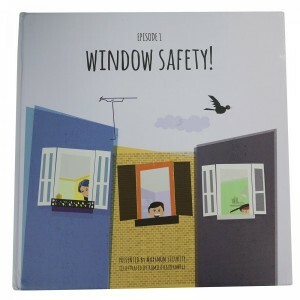 Our first home safety topic focuses on informing children about the importance of staying safe around windows. The storybook features our very own Mascot, Max the superhero, along with a host of other characters, which aim to entertain and educate!